Our children today are the leaders tomorrow; how can they lead if we do not instill in them the principles of goodness and wisdom. Education is most important, they must learn to read the wisdom of wise men, encouraged to ask wise questions in order for wise answers be found. Principles are based upon what is right and fair in the universe, what is give to us by birth, our children must know. Allow children the follies of youth, give them time to experience freedom and liberty without reservations, to taste freedom and liberty gives one a desire for it for a lifetime. Let them frolic in days of youthful years; too soon they grow, yet while the young years mold them they need a happy heart. Produce a good foundation in our children, allow them room for individual growth, but guide them where there are faults and praise them on achievements; a good adult shall appear. Take the time then as they grow, give them all necessary examples of principles with undeniable righteousness, they shall keep them close to rely their decisions on. Do not hesitate, be careful in securing news of their creator within their hearts, no man can be without a heart bathed in love, it gives him character, keeping him fair and balanced. When upon your age, your days lingering in the autumn of your lifetime, give over to your children the business of guarding freedom and liberty; then too they shall prepare the next generation. Children are the holders of our existence, they are the keepers of freedom and liberty for the next generation; prepare them well and freedom and liberty shall prevail a millennium hence. The President’s view on governing has come to a point where anyone clearly looking at the agenda can see his designs as a dictator. What is sad, those in office either do not see it or they are part of it; should it be the latter, nothing short of a regime of 1939 is approaching. History reveals to us all supports of the evil regime came not to power but under direct tyrannical rule also; there is not room at the top for supporters, they only raise the dictator to the top, and then discarded at will. We see today a man brazen and bold, no one opposes him with strength, all bow to him and he rises higher; an ego emboldens him to great heights of control; such a character throughout history is dangerous to the welfare of the people. Citizens under such control find no freedoms only regulations, life is of oppression and sub servitude; have we gone from freedom to servitude without a fight? Listen to Obama’s words, the inflections in his voice; understand this is not a leader or servant of the people but a dictator, a tyrannical ruler. There is no negotiating or compromising with his rule; observe legislation put forth for restoring balance and responsibility of power; it is torn apart, in the guise of compromise, each portion revised and deleted, until the conservatives agree out of lack of steadfast principles. The system has failed, no democracy exists, only totalitarianism reigns freely,[ that being the only free thing left]. Wish as you do, a new election shall bring new hope for the conservative, patriots; yet I see no change, as the ruler has put into the gears of our once free society, a broad post; halting all free elections we are so accustom, whereas the people elect great men to bestow their greatness on this nation. No great man need apply, he will be cut down to a small size, covered in filth [whether true or naught] and defeated by the great ego of all time. Listen carefully, watch attentively, his minions and himself are confident in their quest for total power, nothing shall stand between him and the power over citizens. His minions are mere subjects, used for his own purposes without regard to their future aspirations of power, such is a threat to the mighty One and he shall treat them with no reverence, yet they follow him blindly. Understand the truth, and know there are little choices left; the citizens knowing full well it is our nation, and we did not give it to the mighty One but had it stolen from us; must under all circumstances take it back, delivering to the citizens a new nation under God, indivisible, founded for Liberty and Freedom for all men. In Resolve with the Citizens of the United States of America, we citizens do united and express our grievances for redress; having done so and received no response but be ignored repeatedly do solemnly and humbly re-Declare our Independence. The people of these United States are and ought to be and remain in liberty with freedoms for all. No man or group of men has a right to withhold liberty from the people, so given their liberty by birth under their creator. We have tried for redress yet each grievance received upon deaf ears. The time now has come where citizens unite for the common purpose of one mission, the restoration of America, to put back upon its rightful foundation this free nation. It has been said, a free people shall remain free when they are so educated upon the issues pressing them towards despotism; we are so educated and thereby exercising our rights as a free people to remain free. Citizens of this nation, being so free and living in liberty, has supported all people in other lands the opportunity for freedom. The blood of our citizens being spilled on foreign soil for the sole purpose of spreading freedom, we offer only support and ask nothing but friendship in good faith. Our mission from our beginning being one of peace, joy and prosperity for all, it is our unalienable rights, life, liberty and pursuit of happiness, who could argue or debate such rights; only one with a mind of despotic rule could do so. Why do we demand re-declaration of independence today, opposed to any other time in history? While it is proven, grievances have occurred in great quantity over the past 50 or more years, to our knowledge or experience; yet it is today, that such grievances have so accumulated, whereas the very fabric of liberty securing this nation; is torn by the grievances, enabling the corrupt officials full access to our rights and liberties; stealing them away like thieves in the night. We can no longer allow the destruction of our nation of liberty, doing so, allows this nation become a nation of oppression under despotic rule, where no man shall have rights but only be allowed certain life actions according the rule. We, the citizens of these United States are free and remain firm we will not allow such to change. Americans have no sides to choose, they stand for upholding, and defending the Constitution or we are not Americans as our Founding Fathers so defined us. Many feel our Constitution is old, needs revising, updating for our times; what is our times; but a time of great change not for the better but for the worse, with rights and liberties disappearing, where men need comply with mandates and laws, unconstitutional but enforced and forced upon citizens, too afraid to stand against the enforcers. Most enforcers do not know their supreme law and rely upon the corrupt wolves for guidance, further spreading corruption. The citizens no longer will stand for the constitutionally ignorant to rule them; redress and dissolution of a corrupt government is rightfully requested. No government ought be so large as to consume all laborious earnings from its people, leaving them no bread earnings for which to pursue their happiness. This is the case with our government today, and we have so allowed it, being more content to lie upon the soft bed of complacency of peace rather than be attentive and resist the coming despotic rule. Liberty is not easy to maintain yet we discover it far better attend to our liberties refreshing from time to time our government, than to allow the wolves to tend our governing, causing citizens the labor of restoring Liberty. Shall we agree we have lost to despotism, much of our Liberty and thus need unite for its restoration? The state of no Liberty is the sign tyranny has won; I find it hard for citizens who lived under Liberty, raising the white flag of surrender. Americans only know freedom, they thrive on it; being so absorbed in it, they do not see it seeping away a drop at a time under the guise of tolerant progressive ideology. Debate upon what has brought us to this point, but the point where America has come, must be resolved. America is in dire need of restoration. There is no other method of restoration but a complete cleansing of our government, to put into place, a smaller, fiscally responsible government based upon the foundation and law of the land – the Constitution. We mean nothing more than, for America be set back upon its foundation, allowing governing of the people and by the people be accomplished. Beckon hitherto and sign this important document, the revised, ever spirited re-Declaration of Independence. http://www.thejeffersonians.com, on public viewing, available to sign. “ It cannot be denied that we have among us a sect who believe that to contain whatever is perfect in human institutions; that the members of this sect have, many of them, name & offices which stand high in the estimation of our countrymen. I still rely that the great mass of our community is untainted with these heresies, as is it’s head. 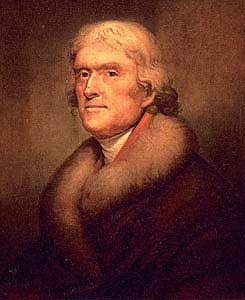 On this I build my hope that we have not labored in vain; and that our experiment will still prove that men can be governed by reason, “you said in your letter to Mr. Mason on February 1791 of which I would like to discuss, Mr. Jefferson. The sect you discuss I am most afraid has never disappeared although from time to time we have at the head one which is tainted by those subscribing to those heresies. We have been most fortunate your labour was not in vain, the people being attentive to the matters of freedom held to those principles, nothing less desired among the masses. Unfortunately, the attentiveness became too laborious for many, seeing slumber under peace desirable over watchfulness for freedom’s enemy. I dare say, Mr. Jefferson, a rude awakening came forth upon this new generation, yet a large sect of this generation still dizzy on a socialist dream stupor. It is the latter and no accountability for their drunkenness behavior, inflicting the country, laws, bills, mandates, and regulations far surpassing common sense. As young people these minorities, known as progressive thinkers, hippies or the like; held free speech rallies condemning the support of spreading freedom, calling any war; bad and unjust, all soldiers labeled murders. If treason was apparent, no one noticed it, nor did they find themselves accountable, giving them undeclared acceptance; therefore continued opening doors in the political arena as they matured in body but not of brain. Corruption has run rampant amongst all socialist thinkers bringing them to communism, as a good change for a country built on freedom. I do not know should these Progressives as they choose themselves called, [ Communist, or Socialist, Marxist they are clearly recognized], see themselves as rightfully chosen in leading the country, their views and opinions may not be harmful, left alone without implementation, yet this is not so. Such Progressives find themselves, so excited, in control over the masses. Being now drunk upon not just progressive ideology but their control, has them on a full run to gain all control and lock up freedom forever from the masses. One question posed them without sensible answer, how does one run or control the masses with no desire for labour, having the masses decidedly unwilling for oppression; with no money for continuation of unworthy programmed mandates; how then does one operate a country under such circumstances? I fear they have no answer, nor want to contemplate such, the very thought of the laboring masses not willing to labour and give over all proceeds of labour does not approach their thinking. This demonstrates the stupor they dizzily rule, it is not real, nor shall it last. 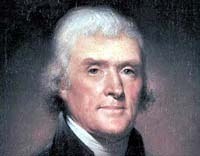 While the progressives marched in rallies and ran for offices unqualified to do so, the majority educated themselves, ran businesses and labored in their professions; raising the next generation with values and principles; to this end we find the majority now well attentive to the needs of America and find your words, Mr. Jefferson, comforting and enlightening, causing them to rise up against the insanity in our government. I find comfort and feel hope in their efforts, the work is not easy but, no one denies freedom is easy to maintain. Your work shall never be considered in vain, the country has had few disruptions in peace, only finding itself in one civil war and it strengthen the values of equality. Perhaps such failure to redress many complaints against our government robs us today, the ability for moving in the direction of revolt with ease. The people agreeing by majority, the grievances presented are tyrannical and many, they fear the minority’s wrath, for what reason I do not understand. No minority as these progressives are, can in reality keep from us our freedom, but we are a kind majority, desiring restoration to freedom without bloodshed; whether this be reality or naught, I do not know. I do know, Mr. Jefferson, there remains hope in the people, and should we need a revolt to restore our freedom we shall find in every man the will to fight, and they shall never back down. Please accept my heartfelt thanks for your words of encouragement, the people praise your words and hold them dear to their hearts, it makes our days enduring our grievances lesser a suffer. Freedom of speech comes with responsibilities and accountability however there needs be no revision of language construction or word ology changes purposely done so in order to keep citizens in an infant swaddling blanket. Citizens need understand, be hardened to life without crying out discrimination or inappropriateness. Shall we never use another analogy for fear inappropriate language when in fact the analogy correctly describes the situation? Where has the country gone, so far to the left, I fear it shall topple over in the weight of regulations and mandates. The Constitution called out as old, too old to rule our citizens, in need of change for the times we are in. I read the words of the Declaration of Independence, a feeling of understanding for the grievances early citizens felt a need to address through revolution. Such an undertaking and sacrifice; these men never wanted for future men to endure such hardships, a Constitution written with stress upon their minds, financial devastation overcoming them; yet our future at their hearts, freedom for all consuming their desires in writing a document to withstand time. The words ring true today, for those with freedom in their hearts; old words they are, but their meaning remains fresh. Only opposition to freedom, fears the words of the Constitution, each word, phrase, gives reason to freedoms rights. These rights are the target by which the leftists opposing freedom. set their minds in destroying. Citizens need see, be exposed on all accounts the cloud of oppression moving in over our freedoms, use their rights, still intact, for suppressing and wiping out oppression. Citizens need find through restoration of America, common sense lost for years, whereby swaddling cloths shall fall away and citizens stand once again as strong. No more will there be blame put upon the words, accountability for ones own actions and reactions take priority. Extraneous regulations and mandates needed no longer when each judged according to their actions; the pursuit of happiness once again placed within our sites, allowing unworthy entitlements no reason for being. A country where dreams pursue and find happiness; men help others out of heart and not mandate, and a man’s word has meaning.